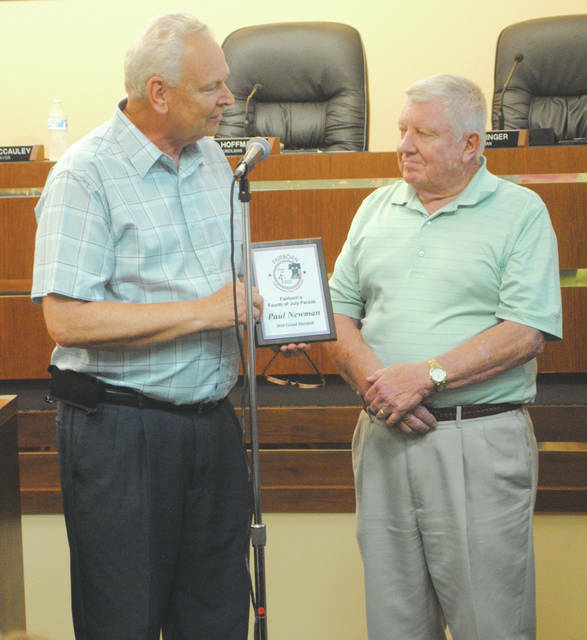 Whitney Vickers | Greene County News Fairborn Mayor Paul Keller presented Fairborn Fourth of July Parade Marshall Paul Newman Sr. with a plaque at the July 16 regular meeting. Newman, along with Fourth of July committee members including Linda Hall, Mecca Brzeczek and his wife, Connie. FAIRBORN — Frank Sinatra may have left his heart in San Francisco, but Paul Newman Sr. said he will leave his heart in Fairborn when Fairborn City Council presented a plaque to him July 16 for serving as the Fourth of July parade Marshall. Newman, a Conneaut, Ohio native, started his involvement with the Fairborn community in 1985 when he became the associate associate athletics director at Wright State. He retired 21 years later in 2006 when he started to serve as the acting executive director of the Fairborn Area Chamber of Commerce through 2016. He has been president of both the Fairborn Rotary Club and Greene County Convention and Visitors Bureau. He is an active participant on committees involving the United States Air Force Marathon, Fairborn Fourth of July festivities and city’s 9/11 memorial monument. Newman is a hall of fame member of college sports information directors of America and Edinboro University’s athletics and received the president’s award for excellence in service from Wright State University, the distinguished alumni award from Edinboro University and the chamber’s civic excellence award. He and his wife, Connie, have three adult children: Paul Jr., who serves as the Greene County economic development director; Michele, a social worker; and Scott, a Wright State Physicians staff member. https://www.fairborndailyherald.com/wp-content/uploads/sites/50/2018/07/web1_paulparade2.jpgWhitney Vickers | Greene County News Fairborn Mayor Paul Keller presented Fairborn Fourth of July Parade Marshall Paul Newman Sr. with a plaque at the July 16 regular meeting. 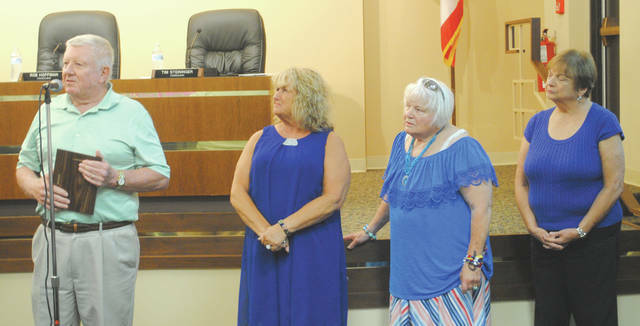 https://www.fairborndailyherald.com/wp-content/uploads/sites/50/2018/07/web1_paulparade.jpgNewman, along with Fourth of July committee members including Linda Hall, Mecca Brzeczek and his wife, Connie.